It's wedding day at the Designer Craft Connection! Welcome to all of you hoppers. Today's blog hop is all about weddings. Each designer is showing a creation related to wedding and there are some beautiful projects and ideas for you. As a paper and scrapbook designer I decided to share with you a layout I did for my wedding album. I have been married for 15 years but until now I didn't have a wedding album. I know..it's a shame! This layout was done as a DT project for My Punch and I was asked to use only a few materials to show a wedding layout that will not be too expensive. 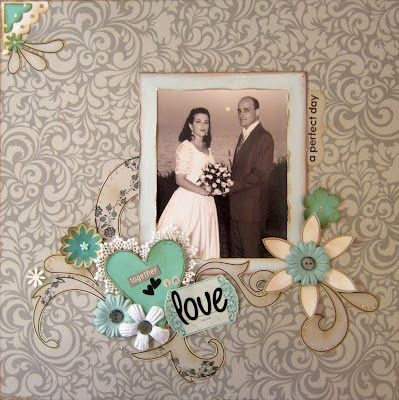 For this layout I used only one sheet of patterned paper, three paper flowers and 12 inches of lace ribbon. All the other embellishments were handmade from paper scraps! Swirls: I cut the swirls from paper, stamped them and add a line around the edges with a black pen. Frame: The frame is a square piece of paper I inked and distressed a little. Flowers: The small flowers were made with two different punches and the heart was cut from a piece of paper. White flower: The big white flower was made from six pieces of white paper I cut in a leaf shape and glued together. The stickers are all scraps I had from different sticker sheets. With a little imagination and creativity you can create beautiful wedding layouts that would look great and would not cost much! To keep on hopping through the entire blog hop just click on the Designer Crafts Blog Connection on the right and click forward to go to the next designer. I love it! just breathtaking!